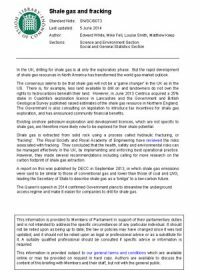 The United Kingdom’s House of Commons Library prepared this note for Members of Parliament, to summarise the status of drilling for shale gas in the UK. 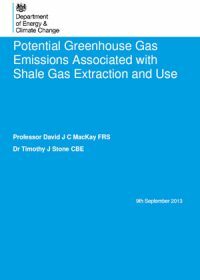 This United Kingdom Department of Energy & Climate Change (DECC) study examines local GHG emissions associated with shale gas exploration and production. 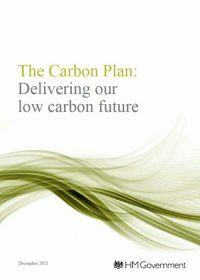 The carbon footprint includes carbon dioxide (CO2) and methane (CH4). Methane has a global warming potential 25 times greater than CO2, based on a 100-year time horizon. It also studies the effect of shale gas use on overall GHG emissions rates and cumulative emissions. Comparisons are made between the emissions associated with the use of shale gas, conventional gas, Liquefied Natural Gas (LNG), and coal. 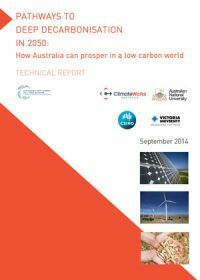 This report provides an overview of natural gas production, the climate implications of expanded natural gas use, potential uses and benefits in key sectors, and related infrastructure issues. 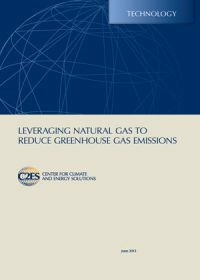 This report explores the opportunities and challenges in leveraging the natural gas to achieve further reductions in U.S. greenhouse gas emissions. 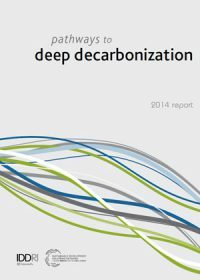 Examining the implications of expanded use in key sectors of the economy, it recommends policies and actions needed to maximize climate benefits of natural gas use in power generation, buildings, manufacturing, and transportation. 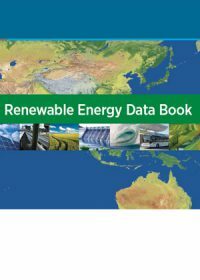 This handbook provides statistics and information - presented in tables and graphs - to describe the state of renewable energy technologies, capacity and growth, in the United States. 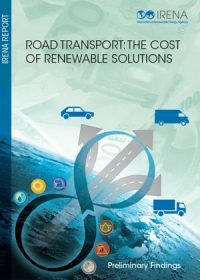 The analysis presented in this report – part of a series of cost studies from the International Renewable Energy Agency (IRENA) – suggests that the outlook for renewable energy in transport to 2020 could be very positive, as long as current policy support is enhanced and expanded. 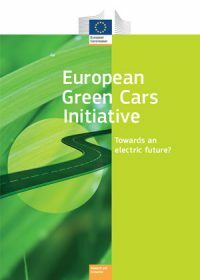 European green cars initiative: towards an electric future? 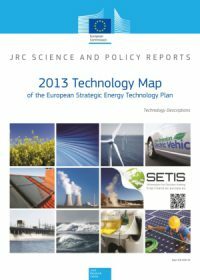 The European Green Cars Initiative is part of the EU’s Economic Recovery Plan and of the Europe 2020 Strategy for a successful and sustainable social market economy. It is an example of action needed today in order to build towards a prosperous and sustainable future. This paper, from Chemistry Central Journal, explores the costs and suitability of using algae as a biofuel. A light review of the current research is followed by an overview of production. 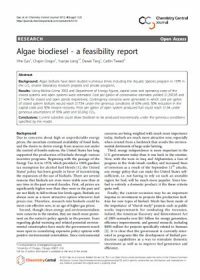 The paper concludes with an economic feasibility assessment stating that open-pond algae as a biodiesel fuel is close to feasibility as a full replacement for diesel, but not without subsidies, considerable technology improvements, or increases in the price of fuel. 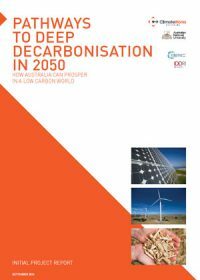 This document outlines the United Kingdom’s plans to achieve decarbonisation within the framework of its energy policy: to make the transition to a low carbon economy while maintaining energy security, and minimising costs to consumers, particularly those in poorer households.